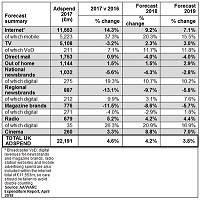 LONDON, Apr 26, 2018 - (ACN Newswire) - UK advertising expenditure grew 4.6% to reach GBP22.2bn in 2017, the eighth consecutive year of market growth, according to the Advertising Association/WARC Expenditure Report - the UK's definitive advertising statistics - released today. Continuing the positive results for UK adspend, the final three months of 2017 saw expenditure grow 6.2% in Q4 2017 over Q4 2016, with adspend breaching the GBP6bn barrier for the first time ever in a single quarter to reach GBP6.1bn. This includes adspend during the crucial Christmas period - a time when innovative and popular ad campaigns have become the hallmark of the UK advertising industry. The full year advertising growth forecast for 2018 has also been upgraded by 1.4 percentage points to 4.2% growth, and a further rise of 3.8% is expected for 2019. 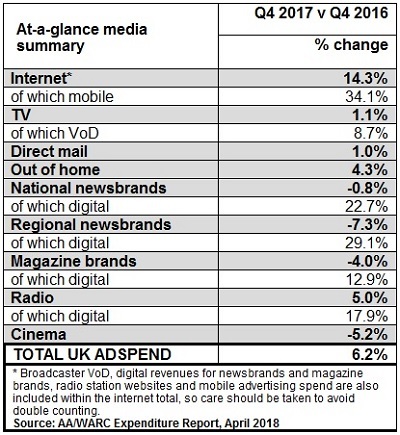 If proved correct, this will complete a decade of continuous expansion for the UK advertising industry. 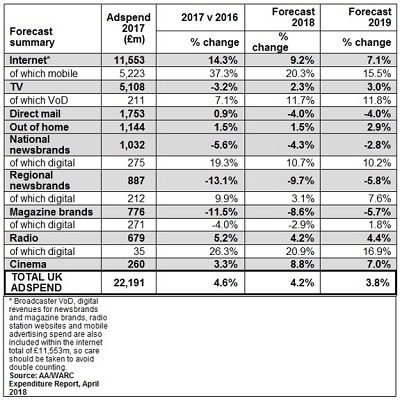 "These very impressive adspend figures demonstrate the strength and resilience of the UK advertising industry over the course of 2017. To see adspend hit the GBP6bn mark in Q4 is a very encouraging result, as is the prediction that we will see 10 years of continued growth through 2019. "The results also reflect wider trends within the UK economy over recent months, with inflation at its lowest for a year, reducing pressure on real wages, strong employment statistics, and the recent upgrade by the IMF of its economic growth forecast for the UK for this year." Looking more closely by sector, digital formats performed well across the board over the course of 2017, up 26.3% for digital radio, 19.3% for national digital newsbrands, 7.1% for broadcaster video-on-demand. Cinema recorded growth of 3.3% and direct mail rose 0.9% over 2017. Adspend growth continues to be driven by internet (up 14.3% over the year), which includes digital revenues for newsbrands, magazine brands, TV and radio broadcasters. Within this, spend on mobile formats (+37.3%) was particularly strong during 2017. "The latest verified results illustrate a dynamic market, one which has now expanded for 18 consecutive quarters. Mobile continues to underpin growth - over 90% of additional mobile investment was directed towards search and social media in 2017 - yet there was vitality across the wider industry. "Radio and cinema both recorded their fourth successive year of rising spend, while the out of home market expanded for the eighth year running. Further, we believe TV's dip, caused mostly by reduced spending within the consumable goods category, is anomalous, and expect the channel to rebound this year thanks in part to the summer's World Cup. "Robust macroeconomic conditions and the continuation of 2017's media trends reinforce our brighter outlook for market growth this year and next." "The UK is a hub for the global ad industry and, with our expertise and creativity, I am hopeful we can continue this run of success into the future. This success, however, is also reliant on getting the right deal from Brexit for our industry and ensuring we have access to the best talent to ensure British advertising remains a global powerhouse." 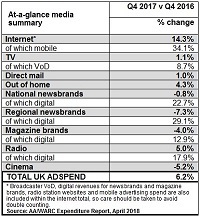 The Advertising Association/WARC Expenditure Report is the definitive measure of advertising activity in the UK. It is the only source that uses advertising expenditure gathered from across the entire media landscape, rather than relying on estimated or modelled data.